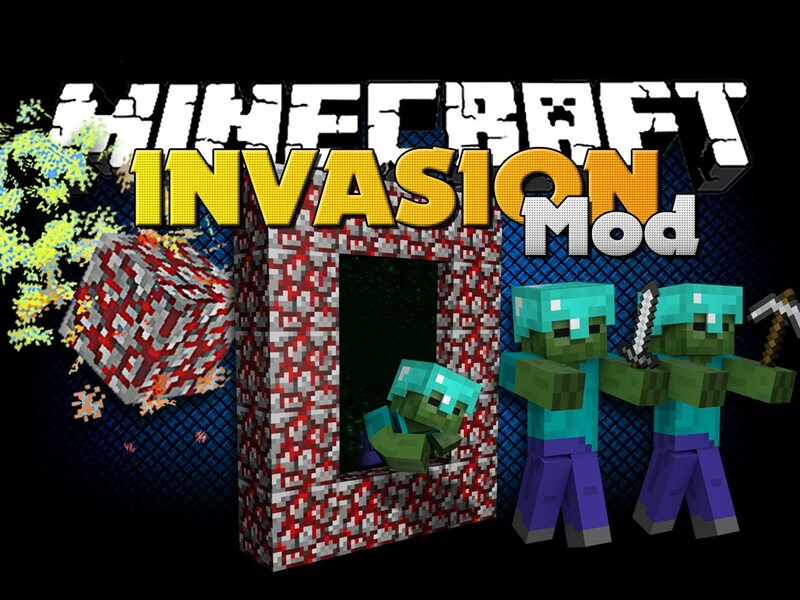 Invasion Mod 1.7.10 gives you the ability to initiate an attack on the location of your choosing. The difficulty steadily ramps up and the mobs are designed to deal with base defenses. The behaviour of all invading mobs has been extensively revamped. Most mobs have new abilities and in this beta stage there are some new mobs and substantially more powerful mobs on the way, geared towards new roles. Spawn an invasion until a nexus is overwhelmed(most reliable way to test your base and no down time). 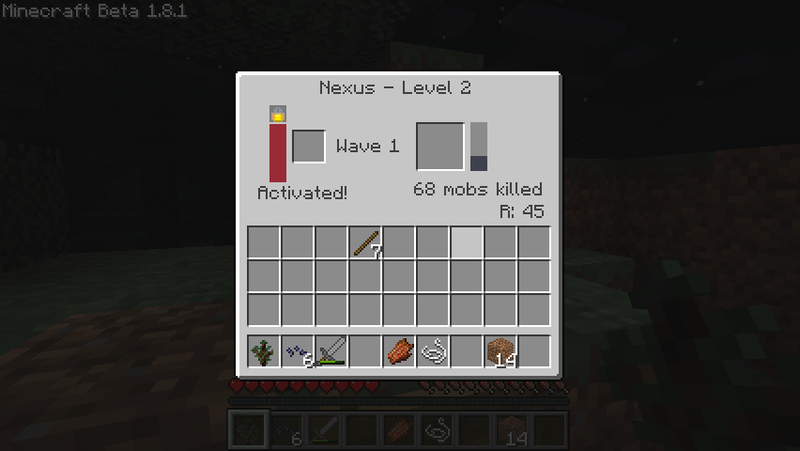 Leave mobs to spawn around a nexus every couple nights if you want to go off and do other things. 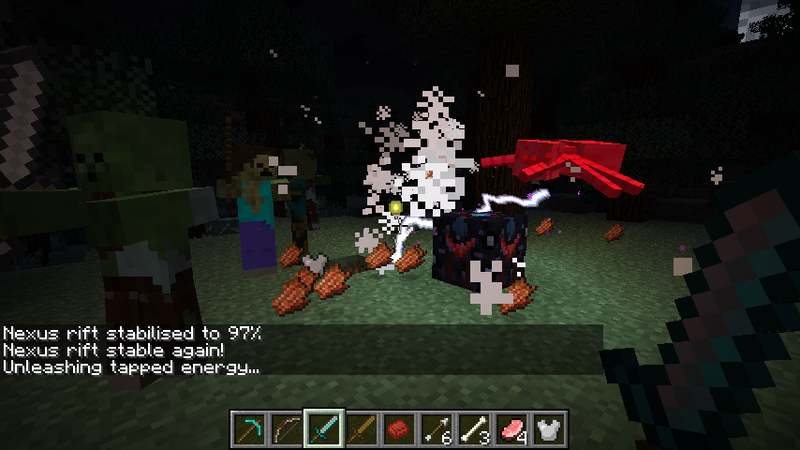 Set mobs to instead spawn randomly at night, like usual mobs but a potentially lot more of them(customisable). Items available, like rechargeable traps, to help defend. Note: the nexus acts as a beacon and GUI for invasions(that’s why it’s there), but mobs spawning at night don’t yet have any way of organising themselves around a player or central point. The area you set up at will certainly take a bit of a beating (a large beating if you are very stubborn and last a long time), but there is no “massive destruction” or silly unfair mechanics that will randomly destroy all your work. This includes the nexus(it does not damage any blocks). Still, you can back up your map if you want. Activated by inserting a regular Nexus Catalyst. Once tapped into a rift to this degree, disengaging is extremely unsafe – it cannot be deactivated! In fact, the block will become unbreakable during this state, though it can be damaged. You get flux, but the other side of this is that mobs will begin to spawn a certain distance away, attracted to the nexus. Mobs will attack players and, given the chance, the nexus itself. If the nexus ever reaches 0%, the activation is broken and the invasion ends in a nasty way to all living things in the area, so be warned! (to clarify, it doesn’t damage any blocks, just living things, and remains afterwards) A nexus is pretty tough though, and its damage state is highly visible. Activated by inserting a Stable Catalyst, the nexus generates flux much more slowly. Mobs sometimes can attack at night, so be prepared. You can tell by sunset whether the nexus will be attacked that night or not. Over time, the nexus gradually charges up. This results in faster flux generation but attacks by mobs become much stronger. Failing to keep the nexus safe will inevitably cause a partial discharge as the mobs overwhelm it, but successful defenses will allow the nexus to reach higher and higher power levels. The discharge in this state is not enough to harm the player, though. You can control the nexus in this state to some degree with damping agents, including shutting it down if needed, but it’s not instant. To defend the nexus in continuous mode, you must deal with the mobs who have destabilised the rift and forced their way into the world. Killing enough of them to restabilise the rift will let the nexus safely draw more energy and help you secure the area. In the case of exiting and reloading the game (given minecraft was able to save), both SMP and SP nexuses should be restored to the state you left it in. You can also adjust the nexus range to suit your base. The range is roughly the area the nexus influences and the range at which mobs will spawn. By default it is 60 blocks outward. In SMP an op can adjust it by using ‘/invasion range [x]’ as a command. In SP, for the moment, you can place 2-8 dirt blocks in the nexus to change the range to between 32-128. Don’t worry, the range is very visible on the nexus interface. Here’s a quick overview of the nexus interface. A catalyst in the left slot will begin to activate the the nexus, progress being the red bar. This nexus is already active and “locked in”. The slot on the right is where rift flux is generated, along with its progress bar too. Wave number is the current intensity of the attack while nexus level is the the furthest wave this nexus has ever reached. It also tracks the total number of mobs’ demise since it was placed. 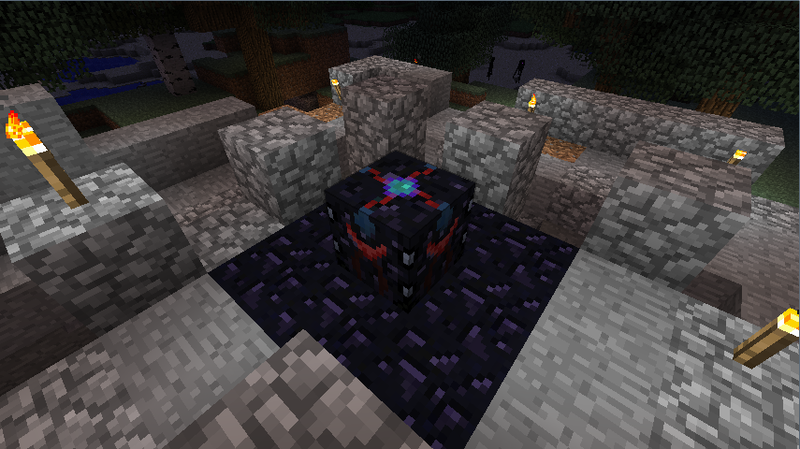 Making a nexus involves taking an obsidian block as a base and crafting it with three redstone and a phase crystal. To make the important phase crystal needed, you will need one diamond and some redstone. 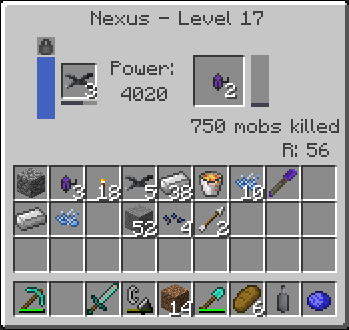 Don’t worry, a nexus is good at generating resources back. The nexus is not a requirement to get lots of invasion mobs spawning. It’s not enabled by default, but you can replace regular random mob spawns at night with as many invasion mobs as you like, and of what type. Mobs will only break blocks if they are actively chasing a player and can be set up to see variable distances. Otherwise, they burn in sunlight similarly to regular mobs. Standby in the future for more behaviours. To enable this, find ‘invasion_config.txt’ in your minecraft folder after running the mod once. You should open it in notepad and you can simply change values and save. For example, change enable-night-spawns from ‘false’ to ‘true’. Mob spawn chance. This is the overall rate of custom mobs spawning. Maximum number of mobs existing at once. Minecraft’s default is 70 but you can override this. Sight range. This is how far they can see you, in number of blocks. Sense range. Similarly, this is how far away they can feel your presence and know you’re there. Maximum group size. This up to how many mobs might spawn together in one spot. With spawn types unchanged, various types of zombies and spiders spawn in place of their basic counterparts. You can change this though, adding any other type of invasion mob and how often they spawn – for example ALL skeletons with some pig engineers. This is easy to set up in the config file. Invasion Mod is slowly generated by the nexus when it is active and can be used to craft things such as diamonds or infused swords currently. Armor and more items will come. You can also find glowing remnants on some attackers that you can craft together into rift flux. One use is to craft them into diamonds, though it still takes significant effort given the rate of flux generation. You could also use them to make one of several useful items, such as the infused sword. Invasion Mod adds a special on-use effect to a diamond sword. Hitting mobs charges it up, which happens quite quickly. When charged, activation by right-click will instantly heal you for 3 hearts. We’ve found this item really helps in a pinch and helps keep up with a lot mobs. You can also use it anywhere in minecraft. A bow with a new feature: You can hold back longer to charge up a fiery arrow that pierces through a number of enemies(if you can line them up) while setting them on fire. Though, against single targets the only real bonus is setting them on fire if you decide to, at the cost of more time to shoot. Without charging all the way, you can shoot an arrow at the normal time for a plain bow to shoot and the arrow will be the same. After that, no more direct damage is gained except a small bonus with the special. This simple item lets you adjust the nexus range on the cheap. It works in SP and SMP (or use the ‘/invasion range <x>’ command in SMP). An upgrade of the adjuster, with a rick-click the material probe also lets you measure the strength of any block as far as invasion mobs are concerned. You should be able to see how bonuses stack and what strength values are without checking a spreadsheet. The probe also can recover traps without triggered them, so you can move or store them. Kind of an empty frame, you can turn these into different kinds of traps. They are always reusable and quite user-friendly, except the one case where you stand on one. The goal of using these is to help keep area control despite being outnumbered, especially in the case of having no buddy to cover your back. You can hear them go off and the rift trap even has an area stun against invasion mobs. To use one, right-click somewhere on the ground to place it down. After a few seconds it will arm and can be triggered by things walking over it. After the payload is spent, the trap sits there empty. You can pick empty traps up as if they were items (they don’t dissapear or lag as they are not items). If you want to remove an untriggered trap, you can use a material probe to safely recover it, otherwise it will drop as an empty trap item if the block underneath is removed. Note that when crafting with buckets, you get the bucket back. The flame trap, predictably, bursts into a 3×3 fireball when triggered. The fire stays around for a little while like a fire shield, but it tends to block players too. Rift traps are created by charging empty traps in a nexus. At the moment this is the only block that charges them, but other devices could be added (or different traps). These traps usually kill the mob that stands on it, but also does some damage to mobs in an area around it and stuns them for a few seconds. The stun only works on invasion mobs at the moment for technical reasons. Don’t worry too much about the charging interfering with flux generation. They both go on at the same time, the current item in the output slot just blocks the other item, like in a furnace. Feeding this bone to a wolf you own will bind it to a nexus if it is nearby (several blocks). Your wolf will then respawn at that nexus if it dies. A purple collar indicates the wolf it bound. It also gains some mob attacking behaviour when not sitting. These items are essentially the fuel for the nexus. It is a one-time cost to activate the nexus, putting it in its generating state. Then, other conditions take over. Stable Catalyst: Activates continuous mode. 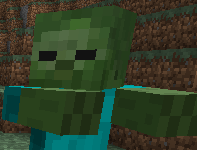 Mobs often engage in night attacks. Difficulty and flux generation increases over time if you keep successfully defending. Recipes create a mixture. Baking the mixture in a furnace produces the final catalyst. This item prevents the nexus from increasing its power in continuous mode while it is in the slot. It is retrievable. The stronger variant actually causes the nexus charge to dissipate quickly in continuous mode. It is, again, removable. If power reaches zero the nexus will deactivate safely. 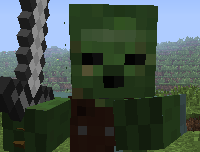 These are the mobs that will try to kill you. The bulk of the attack forces right now are traditional minecraft mobs, except with all-new behaviour and a purpose behind it. As mentioned, armor is still recommended. I can’t give an ETA, but expect the nether to play a part in this, as well as the End. Also expect completely new avenues of attack. Are you sure that’s firm ground you’re standing on? Much more durable than regular zombies and can carry better items. A (broken)sword, for example, gives a large attack boost but they lose the ability to destroy blocks. Beefy, boulder-throwing siege mob. Very dangerous when left alone. His art and exact mechanics are currently being looked at, compared to other mobs being worked on. He’s here for now though. Blocks have a certain strength against invasion mobs when it comes to digging through them. These can be different from the hardness of the material when a player tries to mine it, but it does determine how long it takes for a mob to dig through. Some blocks also get certain bonuses. Here are some of the block strengths, and the material probe item can tell you these values in-game. A construction bonus for these stone-based blocks gives them +10% extra strength for every adjacent stone-based block. This means up/down and left/right, but not diagonals(the blocks must be touching).